"Wine is never the same today as it is tomorrow. It even depends on where you drink it and who you are with and what mood you are in. It's a very, very nice thing." 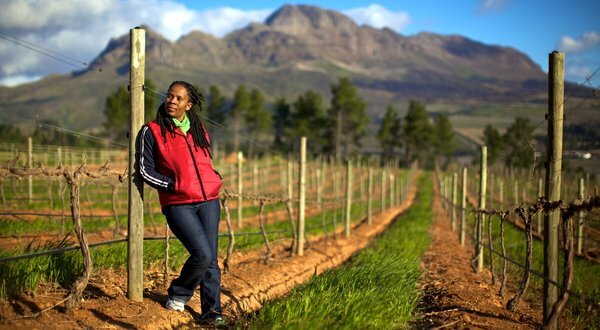 STELLENBOSCH, South Africa — When Ntsiki Biyela won a winemaking scholarship in 1998, she was certainly a curious choice. She had grown up in the undulating hills of Zululand, living in a small village of huts and shacks. People tended their patches of pumpkins and corn. The only alcohol they drank was homemade beer, a malt-fed brew that bubbled in old pots. 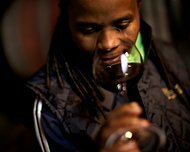 Ms. Biyela smells a glass of wine at her Stellakaya Winery. Reprinted from The New York Times, International, of Saturday, August 27, 2011.